Remote Control Units are available for virtually all types of air bearings and air casters. These units give the operator total control of all supplied to the system as well the ability to control the air flow to each individual air bearing from a central point. Click graphic on left for quick feature guide. Total control of all air supplied to the system in one unit. Separate air flow control gauges on the remote control unit for each individual air caster. Removes the need to adjust air flow at each individually air caster. Allows the operator to make air flow adjustments on the fly as the load is moving. Allows the operator to isolate individual air casters in the event of troubleshooting. Easy and immediate shutdown in case of emergency. Lifting handle(s) for easy portability. RC unit has hand-held pendant for closer control and fine tuning, as well as allowing the operator the flexibility of greater viewing area. RC hand-held pendant also has individual air flow control to all air casters. All 6- and 8-station RC units have caster wheels fitted as standard – optional on 4-station units. Locking latches for control box lid. ARC has caster wheels fitted to allow unit to trail behind the load. Key lock control box lid. 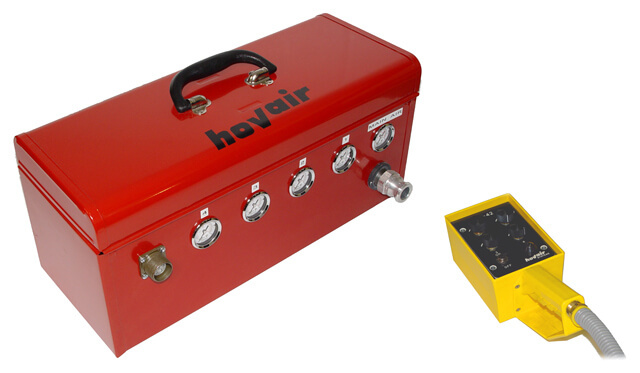 Check out the air bearing and caster kits that are suitable for use with either of these remote control units.